If a thuggy-gangster type passes me while I'm out walking my dog, and says, "Damn, ain't you just the cutest little girl. Mmmm-mmm cutest lil' girl ever," should I a) be flattered that he called me a little girl, b) be grossed out, or c) call it a draw and assume he's talking about my dog (who may or may not be a girl)? Sometimes I wish I was the type of person who was capable of getting angry enough to yell at a stranger out of my window. 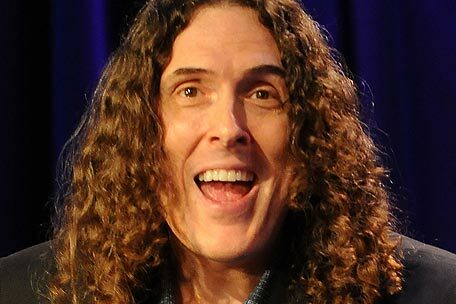 Every so often, I get a little nervous about how much I look like Weird Al Yankovich. When your gut tells you, "This bad-vibe-lady who's following me to the bathroom is going to attack me," listen to your gut. Because she is going to attack you in the bathroom. A) Take the flattery and then RUN and get behind a locked door. You are both the 'cutest'. And all you and Al have is long curly hair. It ends there. Awww thanks Chris. Two nicest things anyone's ever said to me ever.